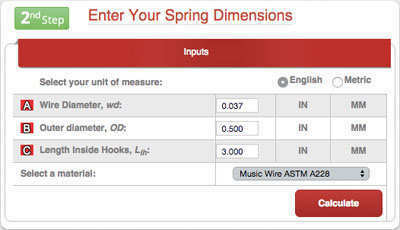 Acxess Spring has revolutionized the spring industry again with an Custom Spring Instant Quote that provides you with a custom quote of your spring in real time using only your spring’s physical dimensions. We have fused this technology with Spring Creator, our powerful spring calculator. Simply use Spring Creator to generate a live spring design and receive an instant quote from which you can purchase your custom springs. Wondering What Your Spring Will Cost? Get an Instant Quote of your spring NOW! 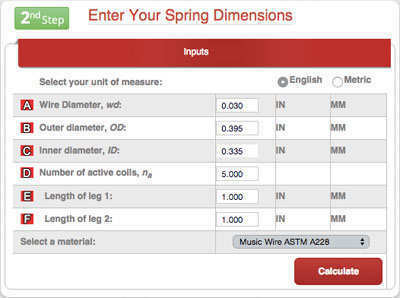 Since we have three spring calculators in one, we will provide you with instructions to generating a quote for each type. We will begin with a compression spring instant quote, then an extension spring instant quote, and, finally, with a torsion spring instant quote. 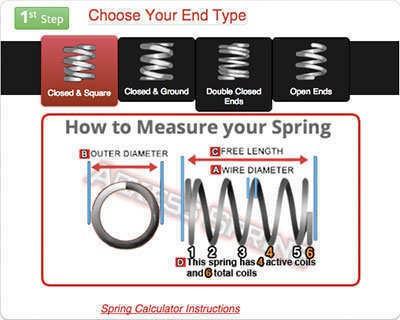 Our compression spring calculator provides you with four different end types to choose from. After you’ve clicked on calculate, review your quote. If you don’t receive a quote you will be notified in the “warnings and helpful tips” section that it is because your dimension inputs didn’t meet the quotable dimension ranges provided above. Select the quantity you are interested in ordering by clicking on Buy Now! If the desired quantity is in between tiers, it is more economical to jump up to the next tier. Although the highest quantity on the instant quote is of 25,000, you can get a quote on much higher quantities by requesting it on the section provided below the instant quote for a much better deal. Do you need 50,000 or 250,000 pieces? No problem! request a quote by filling out the quick quote form provided at the top right corner of the instant spring quote with your contact information and the quantities you would like to have quoted. Please note that these instructions are for the instant quote only, if you want to learn more about how to use our compression spring calculator, click here. Once you’ve clicked on a part, you will be directed to your shopping cart where you may checkout or “continue shopping” and go back to the calculator to generate a different design to purchase. You will be able to adjust quantities or remove items you no longer want. Fill out personal data and contact information. You are able to use the same ship-to and bill-to address but you may also choose to use different ones. Note: You may look up a quote by quote number at the top of Spring Creator to make a purchase for a certain spring. Quote numbers are provided along with your spring blueprint. You’re able to generate a live blueprint and email it to yourself or a comrade. This will include the live blueprint of your spring, the quote with the quote number, and a full spring analysis. 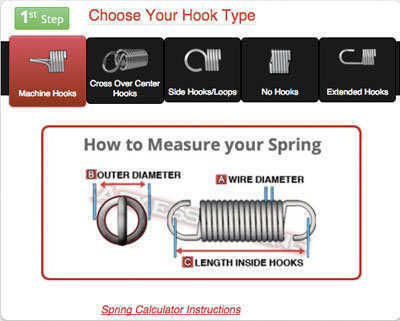 Our extension spring calculator provides you with five different hook types to choose from. Although the highest quantity on the instant quote is of 25,000, you can get a quote on much higher quantities by requesting it on the section provided below the instant quote for a much better deal. Do you need 50,000 or 250,000 pieces? No problem! request a quote by filling out the quick quote form provided at the bottom of the instant spring quote with your contact information and the quantities you would like to have quoted. Please note that these instructions are for the instant quote only, if you want to learn more about how to use our extension spring calculator, click here. Once you’ve clicked on a quantity, you will be directed to your shopping cart where you may checkout or “continue shopping” and go back to the calculator to generate a different design to purchase. 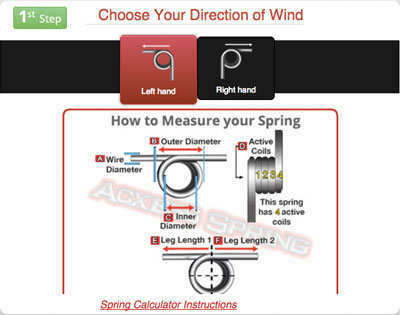 Our torsion spring calculator lets you pick between these to wind directions. 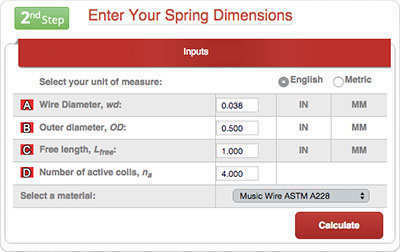 Please note that these instructions are for the instant quote only, if you want to learn more about how to use our torsion spring calculator, click here.